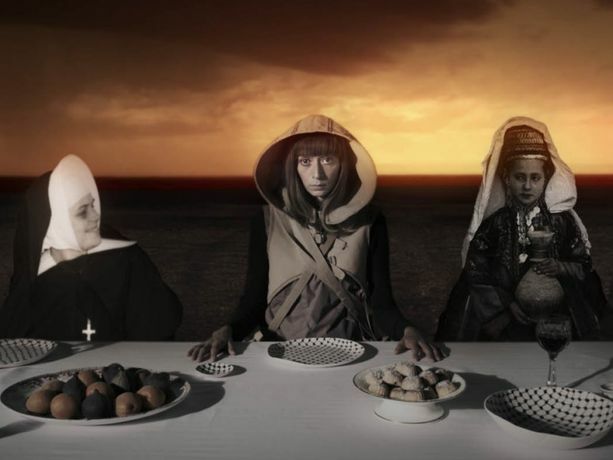 Join us for a special three course supper club conceptually based on Larissa Sansour’s ongoing sci-fi work and her interest in food and politics. Sansour and Palestinian chef and food writer Joudie Kalla, of Palestine on a Plate, will invite diners on a journey through past, present and future. With factors such as limited water resources, land confiscation and harvesting restriction rapidly limiting Palestinian biodiversity, the only way to secure native crops is to move them from biosphere to tech-sphere. The evening’s appetiser embraces the idea of lab-engineered gastronomy. Looking to the present, the main course holds off the looming agricultural extinction and celebrates local produce in a contemporary Palestinian feast. Finally, the dessert reveals a plan to preserve existing crops and culture for the future by manipulating the past with a dish inspired by Sansour’s film ‘In the Future They Ate from the Finest Porcelain‘ currently on show at The Mosaic Rooms. Joudie Kalla trained as a chef at Leiths School of Food and Wine. She has worked within the Gordon Ramsey Group for several years and has run her catering business for over 10 years. In 2015 she published an app called Palestine on a Plate and her cookbook of the same title will be released in September 2016. Preorder here. Tickets: £35 (includes a three course meal with wine). Limited spaces, get your tickets now to avoid disappointment!